View Milicent Coast Basin in a larger map (opens new window). A natural lake surrounded by private grazing land, but there are access tracks on Crown Land. When full, contains redfin to 1 kg, abundant Murray cod to 20 kg, Australian smelt, flathead gudgeon and goldfish. Boating is possible with small boats but care should be taken because of submerged timber. Small boats can be launched from the bank. Murray cod have previously been stocked and may have also entered from overflow of Lake Charlegrark. A natural lake surrounded by grazing land and scrub. When full, contained redfin to 900 g, flathead gudgeon and Australian smelt. The lake has suffered the effects of drought (2008/09). A natural lake surrounded by grazing land. Contained redfin to 1 kg, flathead gudgeon, and goldfish. Has been stocked in the past with Murray cod. Dry in 2008/09. 40 ha. 1,680 ML. Camping, boat ramp. A natural lake surrounded by farmland. Good access on the western shore. The northern and eastern shores are private property. Camping facilities with powered sites are available at the recreation reserve. Lake Charlegrark was the site where the Murray cod propagation techniques now used at the Snobs Creek hatchery were developed. Like most waters in the district, the lake is dry at present (2008/09) but used to contain Murray cod to 35 kg, goldfish, Australian smelt, flathead gudgeon and redfin at times. 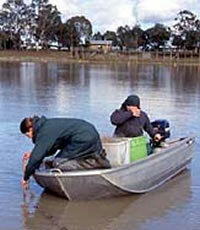 300 Murray cod were released to Lake Charlegrark in 2010 after an 11 year absence. Stocked as yearlings weighing 150-200 grams each and measuring 15-20 cm. They are expected to reach breeding maturity within three to four years and the legal minimum length size of 60 cm within four to six years, depending on lake conditions. A natural lake surrounded by grazing land and accessible from the Horsham-Edenhope Road. Carries abundant redfin av.350 g when conditions are suitable. In mid 2002, the lake was 100 cm deep with a salinity of 6,200 EC. Dry in 2008/09. Was stocked with Murray cod in the 1970's. A natural lake surrounded by farmland. Has a fringe of redgums and a sand bottom. Dry in 2008/09 but used to carry Murray cod stocked from Booroopki Swamp, golden perch, redfin and yabbies. Flows through cleared land and consists of deep pools separated by very shallow runs and abundant aquatic vegetation. Carries a few brown trout, rainbow trout and Yarra pygmy perch but the better fishing areas are in South Australia. A very shallow, sand-bottom lake surrounded by light forest. Carries abundant redfin of a good average size when conditions are suitable, also tench. Freshwater catfish were illegally stocked during the 1990's. Dry in 2008/09. 180 ha. 8,650 ML. Camping facilities and boat ramps. A man-made lake adjacent to Edenhope with grazing land on the northern shore. Abundant aquatic weed makes it difficult to fish and can result in loss of hooked fish. A popular fishing water, reasonable for fly-fishing, and capable of supporting heavier fishing pressure. Water depth was only 50-100 cm in mid 2002 and it was dry in 2008/09. When the water level was satisfactory, it carried redfin to 1.4 kg, (av.500 g), rainbow trout to 1.3 kg, (av.1 kg), brown trout to 2.3 kg, (av.1.8 kg) and abundant tench to 1.7 kg, (av.1 kg). Unspecked hardyhead were recorded in 1971, but there is some doubt about this record. The lake is usually stocked with brown trout and rainbow trout when water conditions are favourable.